"Mr. and Mrs. Dursley, of number four, Privet Drive, were proud to say that they were perfectly normal, thank you very much. They were the last people you'd expect to be involved in anything strange or mysterious, because they just didn't hold with such nonsense..."
SCROLL TO THE BOTTOM (Blue bit) for how to value a copy. A publishing wonder and a book that made reading books OK again amongst kids. For that reason alone JK is a Goddess. Hallowed be her name. It also made her about ten times richer than Madonna. Madonna retaliated by writing her own forgettable children's books. The whole Potter collecting euphoria took off around one trendy Brit dealer on ebay who had sagaciously stockpiled a few boxes of Rowling and a fat packet of genuine Rowling signed Bloomsbury bookplates and started achieving startling results just post millennium. When a Philosopher's Stone hit $15K+, everybody piled in to buy, sell and bid. Issued in illustrated laminated boards and it has no d/w, states first edition and must have 10987654321 on verso of title. Publisher has stated that only 500 were printed and many of those went to libraries, so it is always going to be a difficult book to find and will be collected until Kingdom Come. I was offered a signed copy of this a few years ago and negotiated a fattish sum for it; however the deal fell through when the sellers father bought the book - to keep it in the family. Kind of frustrating. The chap selling used the money for a deposit on a flat. He had worked in a new bookshop. It turned out many copies of this book came from bookshop workers who had kept copies seeing the incipient phenomenom at first hand. One wily dealer even started advertising for the book in 'The Bookseller' - the organ of the new book trade. Another tiresome one was a jolly chap with a host of signed copies presented to him. He wanted to buy a house with the money. Have you seen house prices recently in this benighted island? At the sale on the 24 May 2007, Bloomsbury Auctions set another record with a signed first edition of J.K. Rowling's Harry Potter and the Philosopher's Stone. Intense bidding in the room and on the telephone pushed the final price to a staggering £27,370 (inc. premium). The lucky recipient was a private overseas buyer who has obtained a unique presentation copy inscribed 'To David - with best wishes JK Rowling' with the 1 on the number line circled with an additional identification indicating 1st Edition. This was a fantastic result for Bloomsbury and shows that the popularity of the young wizard continues. At Bonham's a copy described thus -"... first edition, ownership label inside upper cover, publisher's pictorial boards, slightly rubbed at extremities..." made £9000. Go figure, but bear in mind these are not books many people are sitting on -every major Children's sale has one. On the other hand there are a finite number out there, condition is king and hope spring's eternal. As for finding one remember the words of Cadillac Jack 'anything can be anywhere' - one turned up at a little bookshop attached to a stately home. Because it was a hardback it was a £1. Last thing--you have to have 10987654321 to get lift off with this book and the date 1997 and no later date, a dust jacket is impossible because it didn't have one and don't neglect first edition 10987654321 paperbacks from 1997 - they too are valuable. For Current Values - CHECK ABEBOOKS.COM All questions are answered there -type Rowling in the author field, type Stone in the title field, type Bloomsbury in publisher field, then choose highest price, hit search and from the results work down from there. The prices at the very top are generally excessive, over the top and way too much. Generally speaking anything after a fourth edition is very mediocre, fourth and third are modestly worthwhile and occasionally some punter on ebay pays too much for one but you need 10987654321 or at least 1098765432 and it must be 1997 and not Australian or Canadian. See also all the comments below which answer every edition question in the known universe. my harry potter and the philosopher's stone book has the code ISBN 0 7475 3269 9 and the code at the bottom of the page is just the number 30. Also tha man on the back is young and has short brown hair. It also says that Harry Potter was saved by an owl. How much aproximately is this worth? I have a hardback copy of the Philosophers stone. It is a 5th print by Bloomsbury. i.e. has the line 1098765. Can you please tell me how much it is worth? My Harry Potter and the Philosiphers Stone book has the man with short brown hair (thought to represent Nichlolas Flammel) on the back and it also says that Harry is rescued by an owl in the blurb. The ISBN number of this paperback is : 0747532745 and at the bottom of the page it has the line of numbers: 40 39 38 37 36 35 34 33 I wonder if you could tell me wether this is one of the first editions and also wether what the value it would be? kindest reguards, H.
I know this is for The Philosophers Stone, but i have a first edition hard book Order of The Pheonix book. Any idea of how much it is worth? thanks. I was wondering if you could please value my Harry Potter and the Philosopher stone hardback book? Fairly good however it does have a couple of nicks from the base and a name written on the inside cover. Otherwise it is clean with fairly un-yellowed pages. It is a 4th edition 10987654. I have a copy of the Chamber of Secrets with the number line 10987654321. It s a hardback edition by bloomsbury, not Ted Smart etc. It is in very good condition with some mino corner bending. Other than that it is a clean copy. Could you please give me an idea of its value? Just thought i would let you know that i managed to sell my Harry Potter book, (the 4th edition one i contacted you about a little while back) on eBay for £110. Not quite the £950 but still quite a price considering i only bought it for £5!! I have just unearthed my old set of Harry Potter books after hearing about the one above selling for nearly £30000. One i looked inside each book i nearly had a heart attack. Each of the first four books has the number line 1098764321 or the words First edition. Unfortunatly on closer inspection i realised these were the deluxe editions which i believe are fairly unvaluable. Am i right in thinking this? Each book is brand new and unread and the 3rd book states Joanne Rowling which i believe is an error. Could you please tell me whether i am write in thinking these are not very valuable or have i just uncovered a my retirement fund? Check abebooks.com or this blog at Chamber of Secrets to get the lowdown on the de luxes, they are pricy but worth about a thirtith or less of a Signed presentation from the author of the first book. I have what I think are first editions of the Philosopher's Stone and Chamber of Secrets; the numbers/laminated boards/dust jackets indicate towards beign first editions. Can you advise where they might be sold? I have a first edition matching the numbers you listed, bar code number, etc. It is signed by JK Rowling--done at a Denver, Colorado bookstore, although I have nothing to prove that. Of course, I didn't know what I had (I didn't even realize it was signed when I first brought it home) so it has my name written in it and a bit of water damage on the spine and jacket (the color on the spine bled to the inside of the jacket along one edge), but is otherwise in very good shape. First off--how would I authenticate the signature? Second question of course--value? Wondering if you can help value my Harry Potter and the Philosophers stone book. Publishing and copyright dates are both 1997, 6th print. Its a paperback with the price in pounds. Ps it was lamenated and is in excellent condition. What do you think? ive got a hard back one with the isbn 0 7475 3269 9. its got a paper cover unfortunately a name in the front but it counts down from 10 to 1. is this worth anything. yeah your right it is an australian copy with a paper sleeve. so it isnt worth much? I am trying to find out if my copy of the Sorcerer's Stone is a first edition. Roald Dahl's Charlie, of chocolate factory fame." ISBN 0 7475 3274 5 paperback, with the number at the bottom of the page being 10. Should I place the book in a protected place instead of resting cosily on her bookshelf with all of her other books? I am trying to work out what edition my hardback book of Harry Potter and the Philosophers Stone is and what it may be worth. Has price of 10.99 pounds on dust cover. How much is a "Harry Potter and the Philosopher's Stone" with the young wizard and the number line10,9,8,7,6,5,4,3,2 worth? Do you know where it is possible to buy harry potter dust jackets.I have several first editions in good condoition but the dust jackets aren't in such good condition. I desperately need some advice please. I am being offered a HP and the Phiosophers Stone, 1st edition 1st print with numbers 10---1. It has been specially bound by Chelsea Bindery in a beautiful leather jacket. The person selling it claims its one of the first 500, however because it has lost its original cover i belive it is indistinguishable from the paper back which was a 6000 print. It is in mint condition with a JK Rowling signiture which has been properley authenticated. He is asking several thousand (£5000) pounds and if i go for it i am viewing it as an investment. Am i paying about the right money for this? I bought a copy of The Philosophers stone - it is a 1st edition 2nd printing printed in Australia, and i paid about US$200. The numbers in the front are 10 9 8 7 6 5 4 3 2. To my disapointment when i got it it had ads in the back for books 1-4. It also says Joanne Rowling in the front of the book. How much is this worth??? Thankyou! HI, I have a first edition Harry Potter and the Philosophers Stone with the correct isbn and numbers etc. It states hat it was printed and bound in Australia and came in a boxed set with a first edition Harry Potter and the Chamber of Secrets. Both books have their dust jackets and are in good condition (though they have been read several times over). I have looked on the sight previously recommended but can't find reference to the Australian printed editions. I am guessing they don't have the value of the UK versions. Can you help with some clarification? 2. Not much cos its the 2nd OZ edition, sorry mate! Any idea what the anticipated value of the provenanced 'Moonlight Signing Event' Deathly Hallows books will be worth in years to come? These are the halogramed copies signed by JK Rowling with the 'goody bags'. Thanks! The information is freely available at sites such as abebooks.com, bookfinder.com and addall.com -- just put in author and title and choose highest price and work down from that to the lowest price - the book similar to yours is the selling value at present & half that is what you might get if you sold it to a trader or on ebay...you want UK editions if possible. Your 'Hallows is worth what you paid for it and a bit less...bit early for that one! hi i have a copy of the philosopher's stone with the code 0747532745 . could you tell if it is the first edition and what it costs ? 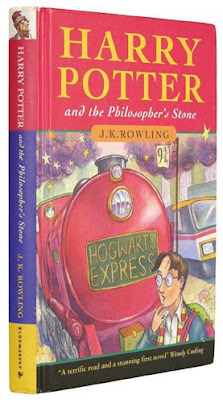 I have a copy of the Philosophers Stone which has the correct prnt run of 10987654321. It is hardback with dustjacket. However the qote on the dustjacket is different to the book so it may be from a different book. It has the quote from Wendy Cooling on the front and looks identical to the above book. It is signed with a dedication by J.K. and is also signed by Thomas Taylor, Daniel Radcliffe, Emma Watson and Rupert Grint. It is in mint unread condition and has only been opened for the signings. I am aware that this is of considerable value but i am not sure how much exactly. Could you give me some idea? Sounds like a supplied jacket --that is a later jacket. Book sounds right. Please email us (address above) if you wish. Hi. I purchaced a copy of Harry Potter and the Deathly Hallows on Midnight of the day it came out. it says first edition. like i said. At the bottom of the page it says First Edition. UK Adult Version. Dustcover too. Any idea how much this is worth? or just the bog standerd price? Your 'Hallows is worth what you paid for it and a bit less...bit early for that one! I have a copy of the Philosophers Stone in paperback. It is a second edition with the print line 1098765432. It is a true bloomsbury with the quote by Wendy Cooling on the base of the cover. Unfortunatly it has been well read and the cover has quite a few creases in. There is also a name written on the inside front cover. Can you please tell me how much it is worth. I would think very little due to its condition but you never know! Also could you please tell me, if you know, how many of the second print paperbacks were actually printed? I have a signed copy of Chamber of secrets reading 'With love J K Rowling x' in decent condition. It's a paperback. Any idea how much it would be worth roughly? I believe that I have a Bloomsbury, Harry Potter and the Philosopher's Stone, 1st state/1st printing, ex-library copy. ISBN: 0 7475 3269 9. Number line: 10 9 8 7 6 5 4 3 2 1. The boards are definitely worn. There are no tears or tape on the book. The cover is very worn on the spine and at the point where it connects to the boards, but it's certainly still colorful and legible and there are no missing pages. The library has stamped the book as withdrawn. I cannot find anything comparable at Abe Books, and I was wondering if you could comment on the estimated value of a true 1st/1st in worn condition. Thanks! Try selling it to one of the people who lists high price potters on ABE or put it on Ebay. If its the true UK first someone might pay a few hundred or even a thousand pounds. Ex Library books are imho pretty nasty but someone who hasn't 'got' condition might go for it. Hi, I have every Australian hardcover first edition, first print run of the seven Harry Potter books. I also have most of the UK editions as well (except the first two of which I have second and third printings). They all have dust jackets and are in minty mint condition. How much am I looking at? Please checkabebooks.com but not a fortune. i have a 1st edition/ 3rd print Philosopher's Stone. i know its not 1st print but how much is it worth? Hi I was wondering if anyone could help me. I have the paperback of "Harry Potter and the philosper's stone".ON the bottom of the front cover it says " Winner of the 1997 smarties Gold Award" and the ISBN is 0 7475 3274 5.Also it has a string of numbers " 50 49 48 47 46 45 44 43" It says "First published in Great Britain in 1997" . Could anyone tell me if it is worth anything? Hi, I just ran across this thread and was wondering if anyone could estimate or could direct me to someone who would be able to, the value of a first edition (first printing) signed copy of the american release of Harry Potter and the Socerer's Stone. I was in 5th grade when our class went to meet J.K. Rowling in 1998... it was before anyone knew about her, and a bunch of us were directed to buy books ahead of time, and then she signed them for us there. you need 10987654321 then it's BINGO!!!!! How can I find out what the print runs were for this printing? I have googled and googled. Any advice re selling it? So far it sounds good. However for it to be worth megabucks it needs to have the print run 10987654321 on the bottom of the copyright page. However as the first copies didnt have dustjackets and yours does it probably wont be that valuable. Hi, I have what I'm sure is a first state US printing of Sorcerer's Stone, first ed. first printing. Because it has the Guardian blurb, does anybody know how much the book should be going for? I've seen prices around but they've been for the much less rare edition without the Guardian quote. Also anyone have an idea of where one could fetch the highest price for harry potter items? hey i have a copy of the TED SMART third edition i.e 10 9 8 7 6 5 4 3 in hard back with the jacket. It is in perfect condition it actually looks liek its never been read and also the copyright is issued to joanne rowling not J.K.Rowling. My name is Claudia and I'm in search of information regarding appraising my J K Rowling Harry Potter book collection. I have acquired the following: 2 soft cover 1st print US Editions Harry Potter and Sorcerer's Stone books, all 1st prints UK Edition Books 1-7 Large Print Editions (Philosopher's Stone ISBN 0747554560) , 2 school books QUIDDITCH THROUGH THE AGES FANTASTIC BEASTS & WHERE TO FIND THEM 1st prints, 2 US Edition Harry Potter and the Half-Blood Prince 1st prints, 2 US Edition Harry Potter and the Deathly Hallows 1st print, 1 US Edition Deathly Hallows 1st print misprint, and 1 letter from J K Rowling office with her Personal Assistant, Fiddy Henderson's signature addressed to me acknowledging my letter to Ms Rowling and a J K Rowling signed bookplate (not a copy). Total of 16 1st print books in great condition! I would like to get information on how to appraise them and authenticate the signature because I would like to add it to the home insurance (just in case). What do you think the value estimate is in your opinion? Thank you for your assistance! From NEW YORK! i have first editions of the harry potter books from the prisoner of azkaban onwards. could you tell me how much these would be worth...if anything of substancial value? possibly the third one? isbn- 0747546290 and 10 9 8 7 6 5 4 3 2 1 written across the bottom. I am wondering if anyone knows if the leather bound US prints of the first two HP books are going to gain in value or how much they are worth. And how much they would be worth if signed. They are first editions. Please could you value my Harry Potter paperback for me? I have Harry Potter and the Philosopher's Stone. It has no dust jacket and no leather bindings, just the original coloured board cover showing Harry Potter in front of the Hogwarts Express steam engine at Platform 9 3/4. On the copyright page, it says first published 1997, then copyright 1997. ISBN number is 0 7475 3274 5. Further down the page, above the Bloomsbury website address, is the number 62. Many thanks. "Further down the page, above the Bloomsbury website address, is the number 62. Many thanks..."
i wonder if you can help or point me in the right direction. Ive got an adult version 1st edition of the order of Pheonix however it is misprinted. Ive got the back of the book at the front and and therfore some of the beggining of the book missing. Ive got a letter from bloomsbury telling me to keep hold of it as it might be worth something in the future but i was wondering if you had any idea of its value? And if it does have some value where i could sell it? I have a 1997 paperback copy of Harry Potter and the Philosophers Stone in mint condition. Triple Smarties Gold Award Winner on the cover. Copyright Joanne Rowling 1997. Cover illustration Thomas Taylor 1997. ISBN 0747532745; Printed and bound in Great Britain by Clays Ltd, St Ives Plc, 60 59 58 57 56 55 54 53. Any idea if this is worth anything? Could you please advise what I should have paid for my Harry Potter? Its the Philosopher's Stone - Ted Smart edition - printed boards, dust cover, print run 10 9 8 7 6 5 4 3 2 1. "This edition published for The Book People Limited 1998". Its mint condition, but I imagine its worth an awful lot less than I actually paid for it five years ago!! I have a Deluxe copy of Harry Potter and the Philosopher's Stone Print number 20 down to 13, Published by Bloomsbury in 1999 and the book has two ISBN numbers? What is the reason for this ? and could you please tell me a bit more about this book and does it have any worth? Good fortune to you on your merry quest! I have a hardback copy of Harry Potter and the Sorcerer's Stone that was printed without the "Year 1" box on the spine of the book. Does this have any value or is it just a bizarre misprint? Ok, i'm freaking out a bit here because yesterday I was looking in a charity shop and I came across a copy of Harry Potter and the Philospher's Stone that had a different back cover. Anyway i've been reading up about it today and it seems that there were 500 copies printed with a different character on the back, I think it is Nicholas Flamel. Do you think it is worth me trying to see if I can get it tomorrow? I hope it is still there, I am kicking myself for not buying it yesterday! It is in mint condition, hardback and with the sleeve thing on to protect it! Without seeing the book it is quite hard to gauge a value. If you send a couple of pictures to tunuot@hotmail.co.uk i would be happy to look at them for you. I'm currently looking for the deluxe box for the seven books. I'm not interested in the books just the case to house them in. If anyone happens to have a spare one or know of one can you please let me know? I assume its a 3rd edition but was wondering if its anywhere near valuable? which also i assume makes them second editions. I've also got books 4 to 7 in first edition but i doubt they're worth much. be great if any one could get back to me, thanks. My dear fellow RTFM --you have the rare 48th edition wort about £1. Regrets. Is it worth anything? Thanks. Hi, i have a Harry Potter Special Edition, Paperback, Philosophers Stone (gold trim, artwork set into the front cover) it is a first edition 10 9 8 7 6 5 4 3 2 1, is it worth anything? I have a second print of the Harry Potter and the Philosophers Stone Deluxe hardback 1098765432 how much is it worth? I also have first paperback of the chamber of secrets 10987654321 how much is this worth? I have a first edition UK paperback of Harry Potter and the Chamber of Secrets that has been signed by JKRowling. There is slight damage to the binding on the spine and the corners but apart from that is in pretty good condition. This is a very helpful website! The only first edition book I have is a paperback of Harry Potter and the Prisoner of Azkaban where the numbers count down from 10 - 1 on reverse of the cover. Bloomsbury publishing Plc, 38 Soho Square, London ISBN 0747546290. Price is £5.99 on the back and in surprisingly good condition! Any suggestions as to what to do with it (if it is in fact valuable) would be very much appreciated! You have far more patience than I oh appraised one!! What do you know of a First Edition (10 9 8 7 6 5 4 3 2 1) of the US version unsigned, also one signed? I'd really appreciate an email responce to gagewells@yahoo.com as well -- thanks! Hi i know this is about the 1st book but i have a 1st edition hard back of the chamber of secrets how much would this be worth? Hi, I have a Harry Potter and the Prisoner of Azkaban book with the IBSN 0747542155 and with misaligned print on page 13. I was wondering if this is one of the First editions? It is an early edition. I've also got a Prisoner of Azkaban book. IBSN 0747542155 and the number line is 10987654321. It's hardcover and says first published in Great Britain, 1999. Is this a first edition?... Or the same as the person who posted above? I would be happy to inform you of its edition. I have a Copy of The Sorcerer's Stone and Pages 185 to 216 are in the book twice. Is the book worth anything? I have a Copy of the Philosophers stone back at home, definetely not first edition as it came in box set with the first 3 books, but it has a what I'm assuming to be a fairly large misprint, The Chapter order in the book is 5,6,7,8,5,6,7,8,9,10 etc.would this be worth anything of note? I checked abe books and didnt really see anything similar. Hi, I have a 1997 Harry Potter and the Philosophers Stone First edition paperback book. The ISBN is 10 9 8 7 6 5 4 3 2 1. Could anyone tell me what this is worth or where Icould possibly sell it. It is slightly confusing though with it being a paperback as I thought they didnt come in paperback. It is in very good condition - never been read. Please help! I have an American HC edition of HP&TSS that is slightly smaller thant he others in my collection, by about a half inch or so. Plus there's no "YEAR ONE" stamp on the spine. A book signed by the author is quite a bit better than one signed on a bookplate...check abebooks.com for comparisons but about 40% less might reflect true value--check Ebay completed sales also. Cheers. adding on from last comment i also have the 2nd and 3rd (hardback) books signed as well. if i sold them together would this increase their value? Hi I have a paperback Harry Potter And The Philosophers Stone book which was bought in Australia and I'd like to know what edition it is. The ISBN is: 0 7475 3274 5 at the bottom of the page there are the numbers: 20 19 18 17 16 15 14. It says it is published in 1997 and printed and bound in Australia. SORRY THE ABOVE HAS NO VALUE AT ALL. It's A paperback Australian 13th edition --possibly worth a dollar if fine. My Family has a Harry Potter and the Philosopher's Stone Deluxe Cloth First Edition, First Printing signed in gold on front cover. The thing with this book is that it comes in it's original cellophane wrapping and has never been opened, still has the original sticker on back of cellophane wrapping showing purchase price of £18GBP. The Book has never been taken out of wrapping or even openend,condition is as new pristine, what sort of value would it have. One more note for the above comment... it is also "Printed and Bound in Great Britain by Clays Ltd."
I have ISBN 0-7475-3274-5 on dustjacket and ISBN 0 7475 3269 9 in book. 'Smarties Gold Award Winner Ages 6-11 - 1997' sticker PRINTED onto both the dust jacket and the hardback cover. Dust Jacket contains text "winner of the 1997 Snaties Gold Award", as well as reviews and acclaim quotes on the inside wings. Wendee--it should not have a d/w--is it the Ausrtalian ed? Ok that one is worth nothing (Sigh). I also have green Harry Potter Prisoner Of Azkaban UK Deluxe 1st edition I think. Book says - This edition first published 1999 in great britain by bloomsbury. Copyright joanne rowling 1999. numbers 10 down to 1. Is it worth anything? I was wondering if anyone could tell me its worth? Thanks! Hello, can you please tell me about mine if you have time. Gold raised title of Harry Potter on front of dust jacket. 1. the first is a UK collectors edition (one with the gold paper edges) philosopher's stone, ISBN 0 7475 457 2 3 and Print number 10 9 8 7 6 5 4 which i think is 1st edition 4th printing? It's also signed by JK Rowling on the dedication page. I still have the golden ticket that I got when she visited perth and it's in very good if not excellent condition. Any idea what it's worth? any clues as to what they're worth? Probably quite good --look at prices on ABE put on Ebay and you might expect about a third of the prices that you have found--still a useful sum. Hi, I was wondering if you could answer a question for me about a copy of 'sorcerer's stone.' my copy has the right color boards, but they don't have the embossed diamond pattern like the others. is this a mistake or just a bce in diguise? Sorry -- not much idea. ABE Books has most of the answers. 10987654321 is a good start. Depends on the condition of your 1st Edition SS. I've seen copies in poor condition sell between 250 and $600 on Ebay. Very good to Fine copies can sell for $800-2500. ALSO - Check your number line page to make sure you cannot see the diamond pattern from the backside of the page. Fakes made from BCE pages have been rampant. The Guardian jacket also came on 2nd printings, so I believe the first print BOOK to be more scarce than the Guardian jacket. I left the comment on 14th Feb. I forgot to ask are they worth anything? Unfortunately all your books are later printings and are worth retail price or less. The lowest number in the first (left side) row is the printing number. At the moment only the first three printings of the Sorcerer's Stone are bringing serious money on Ebay. I have a paperback copy of Harry Potter and the Philosopher's Stone with Smarties 1997 Gold Award Winner sticker on the front. Can you tell me how much it is worth? about £2.50 sorry --its the 26th edition you need 10987654321 for liftoff, bloke above however seems to have gold--check abebooks.com and divide lowest price by 2 or 3 and that's what you might get on Ebay if they are in Excellent condition. For anyone who is interested in the value, I just sold a TRUE 2nd UK hardcover in VG condition for $3,250. Hi everyone! I am a collector of Philosopher's Stone and Sorcerer's Stone books. I am looking for a few more pieces for my collection. If you have anything of interest, please email me at eaglephot@aol.com. Thank you! is my Harry Potter Philosophers stone hardback worth anything? Number sequence 20 19 18 17. For the Feb 11th comment: It all depends on the condition. In VG condition the BOOK would go easy for $1500. With the bookplate around $2000. In Fine condition $2000-3000 for the book and add another $300-500 for the book plate. For the 17th printing of Philosopher's Stone: unfortunately, no it is not worth anything. Anyone who has early prints of Philosopher's Stone soft cover or hard, email me at eaglephot@aol.com. I am a collectore of Philosopher's/Sorcerer's Stone books. Thanks! Hi I have a 1st Edition 2nd printing paperback of Harry Potter and the Philosopher's stone. It has the text Joanne Rowling and illustrator Thomas Taylor1997. Thers is NO Hogworths Crest and the banner at the bottom of the front cover "A terrific read and a stunning first novel" Wendy Cooling. Any idea's on value would be appreciated please. "I have ISBN 0-7475-3274-5 on dustjacket and ISBN 0 7475 3269 9 in book. 'Smarties Gold Award Winner Ages 6-11 - 1997' sticker PRINTED onto both the dust jacket and the hardback cover." Also no more numbers after that... The book is in Great Condition, Never read or used. Is this worth much ? I have a first edition paperback of “Harry Potter and the Philosopher’s Stone” (number sequence 1098765432) which my mother read to my daughter at Christmas in 1997 before the HP craze took off. Shortly after this, my mother saw JK Rowling doing a reading of the book in a Glasgow bookstore and was able to chat with her to tell her how much my daughter had enjoyed the book. Rowling subsequently inscribed another copy of the paperback (number sequence 2019181716151413) to my daughter “For Rebecca, Your grandmother has told me very nice things about you, JK Rowling”. My mother then took a photograph of Rowling reading her book to the children in the bookstore. While I realize that these books and the story surrounding them are a “special package”, could you give me an idea of their individual value? Thanks! Personalized signatures are great in my opinion because they provide more handwriting to analyze. I'd say your signed later printing with the photo is worth no less than $600 US... and it could do well over $1500 if bidders just have to have it. You will have to convert that to GBP yourself. Placing your book on EBAY is the easiest and probably cheapest answer to that question with more certainty. What condition is your 2nd printing in? Any marks, spine creases, soiling or wear? Of course it should have the Wendy Cooling quote on the bottom of the cover in the black area. My 2nd printing has some spine creases and wear as it was read to my daughter and again by my son. It is otherwise in good shape and does have the Wendy Cooling quote on the bottom. Well, I just bought one from a kind lady who posted here last month for 450 GBP ($650 US) in slightly better condition than yours, SO... you have some money there! He is looking for an early printing and passed on the one I purchased. He will not be able to reply until Monday. He should treat you with respect if you are looking to sell. and say TED SMART on spine. Also says inside that the editions were produced for The Book People. No value other than reading value. They are later Book Club edtion printings. Hi I have a UK Hardback of the Prisoner of Azkaban. The number sequence just has a 20 on the line. Does this mean it's the 20th edition?